TS GO. 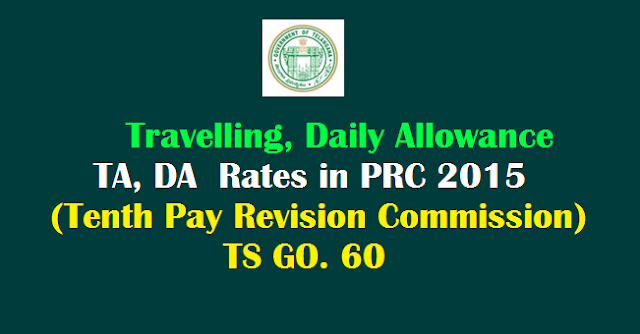 60 Travelling (TA ) Daily Allowance ( DA) Rates, Conveyance Charges in PRC 2015 (Tenth Pay Revision Commission) revised rates as per Recommendations of the Tenth Pay Revision Commission vide TS GO. 60. Allowances - Civil Services (Travelling Allowance) Rules – Recommendations of the Tenth Pay Revision Commission - Travelling Allowance on Tour - Orders - Issued. Grades & Rates of Daily Allowance, Rates of reimbursement, Travel by Train, Travel by Buses of T.S.R.T.C , Mileage Allowance for using own conveyances rates details are available in this GO. 1. G.O.Ms.No.129, Finance (TA) Department, dated: 17.04.2010. 2. G.O.Ms.No.25, Finance (HRM.IV) Department, dated: 18.03.2015. 1. Revision of Pay ranges of Grades according to Revised Pay Scales, 2015. 7. Revision of eligibility to travel by A.C. buses of T.S.R.T.C. Government after careful consideration have decided to accept the recommendations of the Tenth Pay Revision Commission and hereby issue the following orders. The Pay Scales assigned for Automatic Advancement Scheme in respect of Government servants/Non-teaching Staff and the Career Advancement Scheme in respect of Teaching Staff shall not be taken into account for determination of Grades indicated in this para. Only the Pay Scales attached to the posts shall be taken into account for determination of the Grade of such employees who perform the tours. All Government Employees are eligible to draw full daily allowance for the entire duration of their official tour. Enhancement of the maximum amount of reimbursement of Lodging charges at various places within the State and outside the State. As per the G.O. first read above, Government servants visiting, Warangal and Hyderabad/Secunderabad on official duty shall be reimbursed the actual Lodging Charges paid by them subject to the maximum limits as indicated below. Similarly the Government servants visiting places outside the State on official duty are eligible, as per Government order first read above, for the reimbursement of lodging charges, actually paid by them, subject to the maximum limits indicated below. Government, hereby, order that the Government servants visiting various places either with in the State or out side the State on official duty shall be eligible for reimbursement of Lodging Charges actually paid by them subject to the maximum amounts as indicated below. The reimbursement of Lodging Charges is subject to the following conditions. (i) On certification by the concerned touring officer that Government accommodation was not available. (ii) Production of the original receipt from the Lodging House. Government servants drawing pay in the revised pay scale of Rs.28940-78910 (corresponding to the existing scale of Rs.14860-39540) and above shall be eligible to travel by first class. All other employees shall be eligible to travel by second class. The Pay Scales assigned for Automatic Advancement Scheme in respect of Government servants/Non-teaching Staff and the Career Advancement Scheme in respect of Teaching Staff shall not be taken into account for determination of the eligibility to travel by train. Only the Pay Scales attached to the posts shall be taken into account for determination of the eligibility to travel by train. As the railways have dispensed with first class in several trains, it is hereby ordered, that wherever first class is available in the train, the employees, who are eligible to travel by first class, may travel either in 1st class or in 2nd A.C. or in 3rd A.C. or in A.C. Chair car. If there is no first class in the train the employee may travel either in 2nd A.C. or in 3rd A.C. or in A.C. Chair car. The employees who are eligible to travel by second class may also travel by sleeper class. Government also hereby decide, not to allow the Tatkal charges except in cases of journeys between the originating station and the terminating station, that too in cases where there was no sufficient time for the employee to purchase the tickets in advance which should be certified by the controlling officer. Government also hereby permit to reimburse the service charges actually spent by the employee, on production of proof of incurring of the expenses. The employees subject to their eligibility, are permitted to travel by all types of express trains i.e., Super Fast, Sampark kranti, Rajdhani, Satabdi, Garib Rath, ‘Duranto’ etc. These eligibilities are applicable in the case of journeys performed either on official tour or on transfer or in the case of journeys on official tour/transfer/Leave Travel Concession (LTC). The employees belonging to Grade-I of Annexure-I of T.A. Rules, are hereby, permitted to travel by Air-conditioned buses of T.S.R.T.C., irrespective of whether the places are connected by rail or not. Similarly, the employees belonging to Grades-II and III are hereby permitted to travel by T.S.R.T.C. buses of any type, except by A.C. buses, between the places connected by train also and claim the bus charges actually paid, without restricting the claim to the train fare by the eligible class. The Pay Scales assigned for Automatic Advancement Scheme in respect of Government servants/Non-teaching Staff and the Career Advancement Scheme in respect of Teaching Staff shall not be taken into account for determination of eligibility to travel by A.C. buses of T.S.R.T.C.. Only the Pay Scales attached to the posts shall be taken into account for determining the eligibility. The journeys performed by private buses or hired taxies will not be entertained. These eligibilities are applicable in the case of journeys performed either on official tour or on transfer or in the case of journeys connected with Leave Travel Concession. Taxi / Auto charges incurred by the Government employees while on tour to any place outside the State, from the arrival point to the place of stay and ‘vice-versa’ are reimbursable to them subject to production of actual vouchers or a certificate of payment (vide Rule-40 (6) of T.A. Rules). Government servants shall also be eligible to claim actual taxi or Auto fare subject to a maximum of Rs.600/- per day for visiting the offices of the Government of India and Ministries or any other office, situated at the places outside the State, while on tour. A certificate to the effect that Government vehicle was not provided to them and they have engaged Taxi/Auto, shall be appended to the bill claiming the amount. Annexure-IV of Civil Services (TA) Rules, specifies the category of employees entitled to maintain and use their own Motor Car, Motor Cycle / Scooter. Consequent on the revision of scales from time to time, the following table indicates the categories of employees, who are eligible to use and maintain their own Motor Car, Motor Cycle / Scooter, while on tour. 8.1.2. The Pay Scales assigned for Automatic Advancement Scheme in respect of Government servants/Non-teaching Staff and the Career Advancement Scheme in respect of Teaching Staff shall not be taken into account for determination of categories indicated in this para. Only the Pay Scales attached to the posts shall be taken into account for determination of the category. 8.2. The rates of Mileage Allowance payable to the employees who are entitled to maintain and use their own conveyances are revised as follows. a)	Rs.13/- per K.M. for	and maintain their own Motor Car. b)	Petrol driven vehicle. Rs.9/- per K.M. for for Diesel driven vehicle. 2. Employees who are entitled to use Rs.5/- per K.M. and maintain their own Motor Cycle / Scooter. Daily Allowance shall not be paid to the Government servants claiming the Mileage Allowance for their tours. The existing Civil Services (Travelling Allowance) Rules, 1996 and orders issued from time to time shall continue to apply except as provided for in this order. Application of these orders to Officers of All India Services, employees drawing pay in the Revised Pay Scales 2010 and employees drawing pay in the U.G.C. scales, 2006. (a) Officers of AIS in Junior Time scale shall be under Grade II under these orders. (b) Other officers belonging to AIS shall come under Grade I under these orders. For the employees continuing in the Revised Scales of Pay, 2010, the classification of Grades shall be the same as was in force prior to the introduction of Revised Scales of Pay, 2015, i.e. in the G.O. first read above. (a) Government Servants drawing Pay in the Pay Scales of Rs.10000-15200 and Rs.15600-39100 + AGP 7000 and above in the U.G.C.Pay Scales of 1996/2006 respectively shall be under Grade-I under these orders. These orders shall come into force with effect from 01.05.2015 i.e., in respect of the journeys performed on or after 01.05.2015 or commenced prior to 01.05.2015 and continued beyond 01.05.2015. Necessary amendments to the Civil Services (Travelling Allowance) Rules, 1996 shall be issued in due course.